The completion of the upgrade means that all staff members are now using Teams for communications and collaboration needs, which includes chat, calling and meetings. “This truly was the fastest upgrade that we’ve ever done with this large number of users,” said Pouneh Kaufman, a principal program manager at Microsoft. 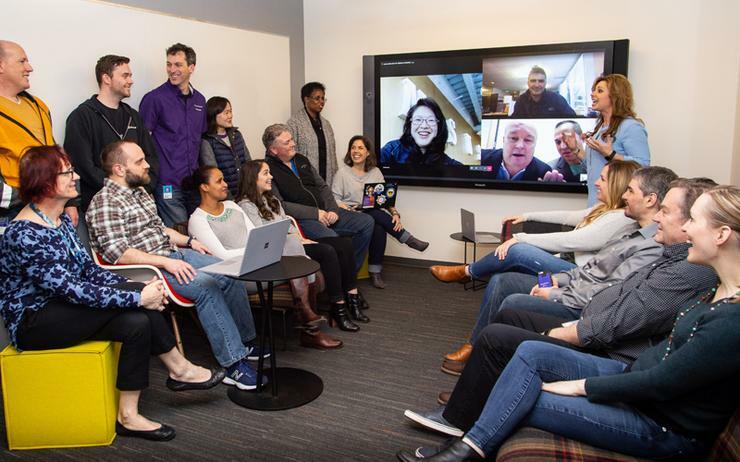 “Moving all communications and collaboration to Teams means Microsoft employees now have one place to go to get work done. Working within the division that led the migration, Kaufman said “a small group” of additional employees and vendors will migrate once certain countries “unblock” cloud-based communication tools such as Teams. “Integrating our business process applications into Teams reduces the back and forth our employees have to do to get their work done,” Kaufman added. According to Mohammed Anas Shaikh - senior program manager who led the technical deployment of Teams - employees were migrated by division, in a bid to align staff most likely to collaborate with one another. Specifically, the team migrated about 25,000 to 40,000 people in each of six waves, with the final round finishing in early March. Kaufman said a “large change management planning effort” was also deployed to help facilitate the deployment among staff, driven by activities such as Teams Tuesdays and how-to videos. Shaikh said there were two steps the team had to take before the migration could occur, which firstly focused on loading Teams add-in into Microsoft Outlook, allowing meetings to be scheduled from all Outlook end points. Secondly, Microsoft built out and implemented a governance plan for helping employees maximise Teams from the outset. Since the upgrade, Kaufman claimed that the quality of calls has increased as a result.